You brush your teeth every day, and maybe you’re even part of the 40% of Americans who’s brave enough to consistently floss as well – but the American Dental Association still recommends that every person over the age of four or five have at least two dental cleanings per year. Why is this the case? Aren’t you keeping your teeth clean enough at home? At Monet Aesthetic Dentistry, our team provides professional cleanings every single day, and it’s one of the most important and necessary things we do to protect the long-term health of our patients. Why are they so important? We’re glad you asked! So what does a dental cleaning accomplish that you can’t at home? Quite a bit, actually! While brushing and flossing are absolutely essential to taking care of your teeth, the truth of the matter is that they are not capable of cleaning every single surface in your mouth. Everyone’s teeth have these small, hard-to-reach areas where plaque can slowly accumulate over time. Eventually, this can lead to the development of cavities, causing a person to experience increased sensitivity or dental pain. One of the main purposes of dental cleanings is to fill in this gap left by your home routine. 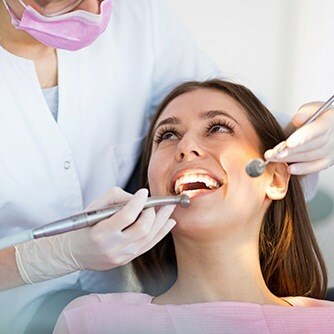 Using sophisticated tools, one of our hygienists is able to thoroughly remove any plaque and tartar buildup on your teeth and gums, particularly targeting those trouble spots in your mouth that we mentioned above. This will not only keep your smile healthy, but these cleanings are also excellent at breaking up minor surface stains, helping your teeth maintain their white sheen! Of course, dental cleanings aren’t only good for your teeth, but your gums as well! Gum disease is actually the most common dental problem in the entire world, and it’s even the leading cause of adult tooth loss here in the U.S.! The cause? It’s a bacterial infection brought on by a buildup of plaque and tartar along the gum line. This area of the mouth is extremely hard to clean with brushing and flossing alone, and that’s where your hygienist comes in. They’re able to reach the section of your teeth that are hidden by your gums in order to remove any harmful debris that could cause an infection. Your hygienist is also an expert on homecare, so your cleanings also give them the opportunity to see how effective your brushing and flossing routine really is. If they think there is a small change you could make to get better results, whether that refers to using different products or slightly altering your technique, they’ll let you know! You can also ask them questions about which kind of toothpaste and brush is best for your unique smile. All in all, it just takes two dental cleanings each year to give you a healthy, beautiful smile you never have to worry about, and they’re certainly worth the peace of mind! To schedule your next dental cleaning with us, give us a call today.